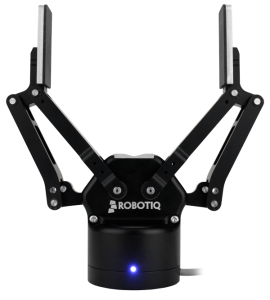 Robotiq’s two finger gripper is ideal for almost all work places that require a high-mix of picking up objects and then placing them back down, with a 140mm opening adjustable on the fly, the Robotiq two finger gripper will speed up productivity in your workplace. The gripper also comes with built in part detection, allowing the gripper to safely pick up fragile and deformable objects without damaging to them. 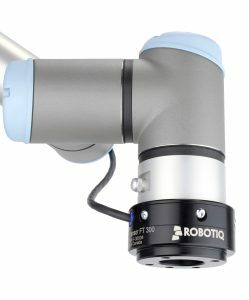 Robotiq have made their product easy to integrate and is compatible with most collaborative robots, including Universal Robots. 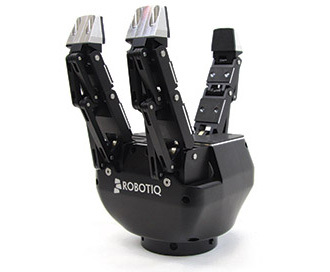 Robotiq’s 3 finger gripper is for the slightly harder things to pick up, as it is more flexible than the 2 finger gripper and also more versatile. The gripper has been designed to give the user easy control of the position of the fingers, the speed and also the force that they use when picking up objects. Robotiq have designed the 3 finger gripper to be easily compatible to Universal Robots and also be used in industrial environments. The force Torque Sensor functions off digital signal, resulting in it not being affected by surrounding noises and will constantly provide a stable, precise measurement of force applied in the task that it is completing. Robotiq have designed the sensor to fit perfectly with Universal Robots, because of this the sensors integrate seamlessly and quickly onto any Universal Robot.